Imagine you are in the market for a cheap used car and you find something that might just fit the bill. The trouble is, it has a reconstructed or rebuilt title. Now what? Is this car safe to buy? Is it worth the money you are going to save? Will you be able to insure it? These are the things you need to consider before you purchase any car with a rebuilt or reconstructed title. People will often use the phrase “salvage title” incorrectly. As we’re about to see, that only applies to a car that’s not legal to drive on public roads. Most often the seller actually means “rebuilt title” – one that has been inspected by the state and is legal to drive and insure. We’ve also compiled a helpful list of Each State’s Requirements to Get a Rebuilt Title, so you can learn what you must do to earn a rebuilt title for your car. This will also shed light on what might have led to a car having a rebuilt title in the first place. Use the links below to navigate the guide. What is a Reconstructed or Rebuilt Title? Should you ever buy a rebuilt car? How does a car get a Rebuilt Title? Rebuilt Title vs. Salvage Title: What's the Difference? What is a Reconstructed, Rebuilt, or Prior Salvage Title? For starters, they’re all the same thing. Typically, a car is branded salvage after an insurance company declares it a total loss. The salvage car itself can’t be driven on public roads; for it to ever see the highway again, it must first be repaired. The salvage car can then be sold to a rebuilder who will either use it for parts or attempt to restore it. They can choose to repair the car to the point where it passes the rigorous requirements for a Rebuilt Title, otherwise known as a Reconstructed Title or Prior Salvage Title depending on the state. The car can then be resold for regular use on public roads, but the title will forever bear the proof of what happened. Most people assume that because a car is prior salvage, it should be avoided. There are times when this is accurate. After all, the damage could have created a weak structural integrity that’s impossible to see with the naked eye. Even if the repairs were good enough to get through inspection, how do you know the car’s structure is truly sound? You don’t want to take your rebuilt Porsche out for a spin, only to realize it gets a deadly wobble at around 100 MPH. That won’t end well. The real question is, who did the work? Sometimes a car with a rebuilt title was professionally reconstructed. The standard for this professional might be as high as the automaker themselves. If the car passed inspection and earned a prior salvage title after undergoing extensive repairs at a reputable facility, it’s probably one you can trust. Your neighbor’s Chevy he fixed under a tent in the driveway? That needs a closer look. Did your mechanic say that you have frame damage on your vehicle? Find out what frame straightening is and if it’s right for you. How can you tell if a car has been rebuilt properly? The biggest concern with purchasing a rebuilt title car is that there’s no way for a regular person to tell how well the repairs were done. Because of this, we advise that you always have a mechanic closely inspect any reconstructed car you are thinking of purchasing. $100 or less is a small price to pay for peace of mind. Before buying a rebuilt car, you’ll want to call your insurance company for verification that you’ll be able to get a policy with the title in question. Sometimes, they aren’t able to value the car with a rebuilt title. Other times, they won’t provide full coverage. This varies from company to company and it’s worth finding out early on. You’ll pay less either way! The best part about a reconstructed titled car is that they are always going to sell for less than one with a clean title. If you find one that’s been appropriately rebuilt, you could score a fantastic deal. Most states require that the reconstructed car gets a complete safety inspection before receiving a rebuilt title and being allowed on public roads again. The following is a general overview, or skip ahead to see Rebuilt Title Guidelines by State. Many states mark the title with an estimate of damages if it reaches a specified percentage of the car’s resale value. For example, both Louisiana and New York will total a car if the damages meet or exceed 75 percent of the car’s value. This is the most common approach, and the percentage varies by state. In states like Florida, the salvage title reflects what can be done with the vehicle. On the title itself, it will either state “rebuildable” or “not rebuildable.” This allows the insurance company that declared the loss to deem whether the vehicle could be rebuilt properly or not. If they choose the latter, they will issue a Certificate of Destruction that prevents the car from ever being properly titled again. In short, it’s a goner. In other states, rebuilding a salvage car can be a difficult task. For example, in Georgia, the person looking to reconstruct a vehicle must be a licensed rebuilder. Otherwise, they can’t even purchase a salvage car in the first place. In the state of Nevada, in certain cases a car must be given a rebuilt title even if it was never given a salvage title. For example, if the cowl assembly, roof assembly, front inner structure of the unibody, or floor pan assembly were replaced, that car is now going to receive a rebuilt title and skip the salvage stage. Many people start shopping for a used car and never really think about the title. It becomes easy to overlook the status of that car. That’s why it’s imperative to do a title check and determine whether or not the vehicle comes with a rebuilt title or salvage title. Find out using our quick and easy $10 VIN Check. Salvage and Prior Salvage titles are two different things, so you need to understand what you are dealing with. The ideal situation is to find a clean title. This means there car has never been in a major accident that the insurance companies are aware of. We always suggest having a mechanic verify any car, even a clean-title car, just to be sure. A salvage title means the car has been in a major accident and was deemed a total loss according to an insurance company. A salvage titled car might look fine from the outside, but something happened to diminish its value and force it off the road. Critically, you can’t get insurance with a salvage title and it is illegal to drive on public roads. The rebuilt title, on the other hand, means the car used to have a salvage title. Then, someone repaired it and made it roadworthy again and it passed a state safety inspection to verify the repairs. The reconstructed title doesn’t mean that the entire car was rebuilt; it simply means someone did enough work to get the title upgraded. Someone from the state had to inspect it and deem it safe, adding a layer of trust that the car is reliable to drive. The only time we would suggest buying a car with a current salvage title is if you are an experienced mechanic trained to handle the rebuild. If you decide that you want to save some money by purchasing a car with a prior salvage title, we have a few tips to help you out. Where was the vehicle repaired? Is it an area of the car that could compromise your safety or were the repairs done to fix cosmetic issues? Ask the seller what happened to cause the car to have a rebuilt title. 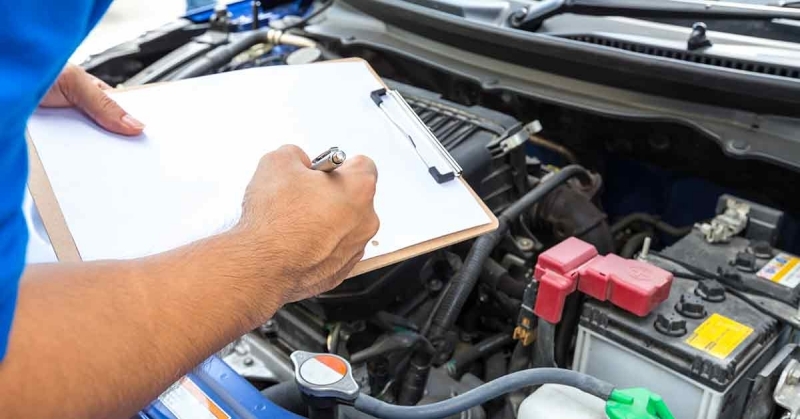 Make sure you pay for a mechanic’s evaluation before making a decision. You might be getting a good deal, but you’ll spend a lot of money repairing someone else’s problems if you aren’t careful. Make sure you have the answer to this before making a purchase. 5. Don’t pay too much! Rebuilt titled cars have different values from their clean-title comparable models. They will also cost less because they were once salvage vehicles. Don’t ever pay top dollar for a vehicle with a reconstructed title. Each state has different conditions about what must happen for a car to receive a rebuilt title. Some are extremely rigorous, others are more lax, but none are what you might call “easy”. Here are the guidelines for rebuilt titles, state by state. For car buyers: This will serve as peace of mind that a rebuilt car has been thoroughly vetted. For rebuilders: This will serve as a checklist for receiving a rebuilt title in your state. According to the Alabama Department of Revenue, you must comply with Section 32-8-87(k)(3), Code of Alabama 1975 when applying for a rebuilt inspection. That requires you submit an application (INV 26-15), current salvage title, a bill of sale for all the replaced parts, a copy of registration receipt before salvage, remittance advice and a $90 inspection fee. According to the Alaska Division of Motor Vehicles, you must provide several components. The first is the title which indicates the VIN from the chassis or frame. Then, you need to supply the bills of sale or invoices for any major parts that were replaced. A law enforcement officer must inspect the vehicle and confirm its identity. Applicants will then complete Form 829, the Reconstructed Vehicle Affidavit and submit that with the vehicle inspection, bills and title. The affidavit must be notarized. The Arizona Department of Transportation says that you need to fill out the title application and have a Level III inspection completed. You’ll also need to submit an emissions compliance certificate, surrender your salvage title and pay a $4 title fee. You must provide your driver’s license and an invoice from all parts you replaced. DMV.org outlines how to get a rebuilt title in Arkansas. You must submit a completed Affidavit of Reconstruction of Salvage Motor Vehicle (REV 2009) as well as information regarding how it got restored, the parts used, how they were obtained, the VIN of the vehicle and a $10 title fee. You can register a salvage vehicle in California through the process outlined by DMV.org. You will need the Application for Title or Registration (Form REG 343). Make sure you add in the cost of labor into the total vehicle cost. Then you need to prove ownership, a Statement of Facts (REG 256) needs to be completed regarding the damages and repairs, and a $2 fee must be paid. You’ll also need a vehicle inspection from the California DMV (with a Verification of Vehicle, REG 31) or from the California Highway Patrol (with the CHP Certification of Inspection, CHP 97C). The Colorado Department of Revenue says you need the following items to get a rebuilt title. First, you need to complete the Salvage Title Statement of Fact (Form DR 2424). Then, sign the statement on the Salvage title claiming the car is now roadworthy. They expect you to stamp "REBUILT FROM SALVAGE," with each letter being not less than one-fourth-inch in size on the body post to which the driver's door latches for the inspection. An inspection is then performed by a P.O.S.T. Certified Inspector using forms DR 2704 and DR 2706. You will owe a $20 inspection fee. From there, you can apply for the Certificate of Title at the county motor vehicle office with your ID, salvage title and forms DR 2424, DR 2704 and DR 2709. DMV.com says that in Connecticut you need to submit a formal request to the DMV before getting a title for the rebuilt motor vehicle. This requires that you take the car to the DMV Wethersfield or Hamden office with a car carrier or a flat-bed trailer and complete the Salvaged Vehicle Repair Report (Form K-186) along with photographs of the rebuilt vehicle. You will need proof of identification, ownership, and all titling and registration fees. The inspection costs $88. The Department of Motor Vehicles in Delaware requires that you first meet with an inspector at a specified time at one of their offices. To pass, the salvage title must be in your name, you need the total loss letter from the insurance company or bill of sale, and you must provide photographs of the car before the repairs. Then, every fix must be documented and an invoice needs to be provided for all the replaced parts. Once you pass the inspection, they give you the Application for Title (MV214). You can then take your salvage title, MV214 from the State Police, proof of insurance, and the Vehicle Inspection Report with a $35 fee to the DMV and apply for a title. According to DMV.org, you can apply for a rebuilt title with your existing salvage title. The local tax collector will issue a temporary license plate so you can drive it to the inspection. Then, you need to make an appointment with the local DMV Compliance Examiner and take your proof of ownership, the total loss paperwork, and the Florida salvage title that indicates a rebuildable status (as opposed to non-rebuildable, as determined by insurance). Other required forms include the Application for Certificate of Title With/Without Registration (Form HSMV 82040), the Statement of Builder (Form HSMV 84490) and the original bills of sale for all the replaced components. You must also bring in two pictures of the damaged vehicle before you repaired it and a copy of the insurance repair estimate. You will have to pay the $40 inspection fee and $20 for each additional inspection required. Once you get a rebuilt title, you must affix a special decal to your car and you can’t ever remove it. The Georgia Department of Revenue requires that only licensed rebuilders can apply for a rebuilt title. 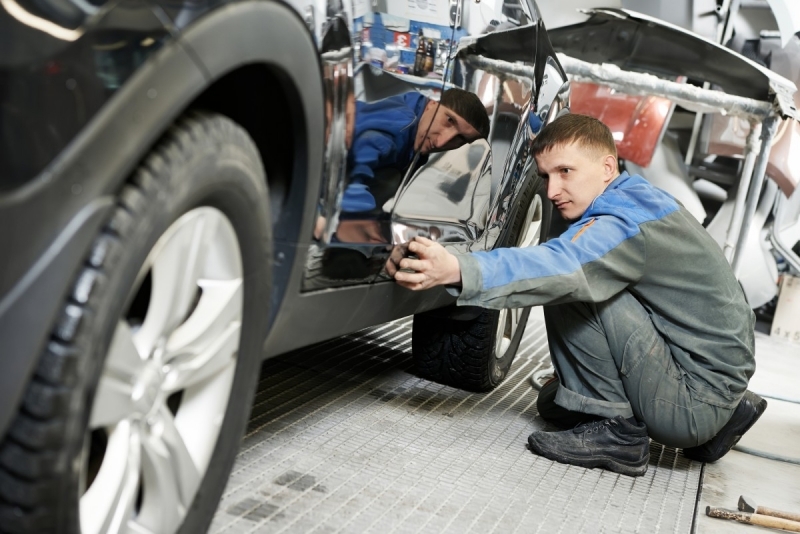 The vehicle must pass inspection before you paint it. In addition, you must tow the vehicle to the inspection. You need to bring at least one photograph of the car before repairs and a completed MV-1 Title/Tag Application. You’ll also want the original salvage title, completed Form T-22R (Request for Inspection of a Rebuilt Motor Vehicle), and completed Form T-129 (Labor and Parts Certification). These must be accompanied by all parts receipts, including part and stock numbers, and a $100 inspection fee. If the vehicle passes inspection, you must pay $18 to the Department of Revenue to get the rebuilt title. DMV.org says that you can’t repair your own salvage titled car in Hawaii. Instead, you need to go through an approved Salvage Repair Dealer. They will perform the repairs and inspect the vehicle for you. Each county has its own inspection and titling fees. Idahodriverslicense.org says the state requires you to provide your salvage certificate and Form ITD 3311 when you apply for a rebuilt title. Before that, you need to have the vehicle pass an inspection. This has to be done at the local Idaho DMV office and a $14 fee must be paid. According to DMV.com, Illinois does not allow cars older than nine years old to be rebuilt and sold. Eligible cars must first be inspected by a state-approved inspection facility. They will examine each replaced part for proper installation and quality. Then, apply for a new title at the DMV and pay the associated fees. According to DMV.org, the state of Indiana allows you to apply for a rebuilt title once you’ve repaired the salvage car. You would need to submit the rebuilt vehicle title packet. This includes a Salvage Motor Vehicle Restoration Title Application Checklist, the Application for Certificate of Title for a Vehicle (Form 205), the Affidavit of Restoration for a Salvage Motor Vehicle (Form 44606) and an Odometer Disclosure Statement (Form 43230). You’ll also need the General Affidavit (Form 37964) for parts purchased during the rebuild. In addition, they will want the vehicle’s salvage title and proof of ownership for each component you replaced. The title application fee is $15. The Iowa Department of Transportation has a list of the required documents needed. First, you must have all the documents proving ownership over all the parts you put on the car. You’ll also need the title and an inspection from the Bureau of Investigation & Identity Protection. You then have to pay the fees for registration minus the taxes you paid on parts. In Iowa, you cannot drive an unregistered vehicle to an inspection facility unless you obtain an Affidavit to Operate a Vehicle for Inspection from the DMV first. DMV.org says that you need to first head to the Kansas Highway Patrol Inspection station where the officer performs an inspection of the VIN and rebuilt parts. If you pass, they give you a completed inspection form MVE-1. You will be required to pay a $20 fee and you’ll have to attach a permanent rebuilt salvage decal to your car. From there, take a completed Title and Registration Manual Application (Form TR-212a), the MVE-1 you received from the VIN inspection, your car’s salvage title, proof of insurance, and all applicable fees to the county treasurer’s office and apply for a rebuilt title. The Commonwealth of Kentucky outlines the process of getting a rebuilt title. You will need the TC 96-215, Affidavit of Motor Vehicle Assembled from Wrecked or Salvage Motor Vehicles, and it must be notarized. You’ll also need to submit the original salvage title and all the receipts from the parts purchases. These must be the original receipts, not copies. You must write out an original description of all labor performed and all parts replaced. You’ll also need a statement from your insurance company regarding the extent of the damage. DMW.org states that to apply for a rebuilt title in Louisiana, you need the salvaged title, a completed Affidavit of Physical Inspection, an Application for a Salvage-Reconstructed Motor Vehicle (Form DPSMV 1634), a Vehicle Application (Form DPSMV 1799), the vehicle’s bill of sale, a list of all replaced parts, and a payment method for all applicable fees and taxes. DMV.org states that Maine utilizes two different types of rebuilt titles. The Standard Rebuilt Title is for cars that contain at least one new part, but less than five. The Rebuilt Salvage Title means you’ve replaced more than five parts or you used a front or rear clip to repair the vehicle. You need to have a certified repair shop rebuild the car and fill out the Affidavit of Rebuilt or Repaired Salvage Vehicle (Form MVT-103). Then, the vehicle must pass inspection. Once you are ready to submit the application, head to the DMV with Form MVT-103, a bill of sale for every new part, and payment for fees. The Maryland Department of Transportation says you need to have a vehicle inspection through the State Police to obtain a prior salvage title. Once you are ready to apply for your rebuilt title, you’ll need proof of ownership, the application form, proof of salvage inspection from the State Police, the Safety Inspection Certificate, proof of purchase, odometer disclosure statement, and payment for all applicable fees. The Massachusetts Registry of Motor Vehicles says to receive a reconstructed title, you first need an inspection stamped with the Registrar’s signature. Then, you can apply with your completed application (RMV-1) form, current salvage title, current registration and $75 fee. The Michigan Secretary of State says you must have an inspection from a law enforcement officer to obtain a prior salvage title. This costs $100 whether you pass or fail. Once the vehicle passes, complete Form TR-13A (Application for Salvage Vehicle Inspection) and Form TR-13B (Salvage Vehicle Recertification Form). Take that paperwork and the original salvage title to the DMV branch office with your $15 title fee and taxes. DMV.org states that Minnesota allows you to clear a salvage title with the following steps. Start by passing a salvage inspection. Then, take the title, Application to Title/Register a Vehicle (Form PS2000), Declaration of Reconstruction/Special Assembly (Form PS2015A), a bill of sale from all the parts used in the rebuild, the inspection report, and a $10 filing fee to a Minnesota Driver and Vehicle Services office to apply for a prior salvage title. This bring us to what’s known as the Minnesota Title Loophole, where certain cars can legally receive a clean title even after sustaining serious accident damage. To see the criteria and learn how scammers use this to their advantage, read more here. According to DMV.org, some cars in Mississippi won’t ever receive a salvage title. If you have a car that is ten years old and is valued at less than $1,500, it won’t receive a salvage title in the first place. For other vehicles, to get a rebuilt title you will have to repair it and have an inspection. The facility will complete the Application for Inspection of a Salvage/Rebuilt (Form 78-021) after you supply a picture taken before the repairs, a bill of sale for all parts involved in the rebuild, and a $75 check. They will provide an additional Completion of Vehicle Inspection (Form 78-022) which you will submit with your other paperwork and a $9 fee to the Mississippi Department of Revenue. In Missouri, DMV.org says that you can receive a prior salvage title by submitting the Application for Missouri Title and License (Form DOR-108), Notice of Vehicle Titling Requirements (Form 5043), current proof of ownership, current title and Vehicle Examination Certificate (Form DOR-551) from an approved inspection facility. Montana regulations allow you to operate a salvage car on the road if you prove to an inspector that it has been rebuilt. To do this, you need the bills of sale for all replaced parts, documentation that the vehicle is yours, and to pay a fee. If you don’t follow those rules, you can be fined up to $500 and charged with a misdemeanor! The Nebraska Department of Motor Vehicles issues a previously salvaged title when you get a vehicle inspection after making repairs. Simply submit the Certificate of Title, the completed Application for Certificate of Title, the inspection report, and a $10 fee to any County Treasurer. The Nevada Department of Motor Vehicles requires a salvage car to be inspected by a licensed body shop or garage and also the DMV. Then, take the Certificate of Inspection for Rebuilt Vehicles, your existing title, and a payment method for fees to the DMV. The New Hampshire Division of Motor Vehicles allows you to make appointments for inspection, but you need to pay the $50 fee when you schedule. You will need to provide the vehicle, proof of ownership, insurance adjuster’s report and evidence of repairs. Then, you must adhere a salvage decal to the car and you’ll then be allowed to apply for a Rebuilt Vehicle title. The New Jersey Motor Vehicle Commission requires you to make the repairs and have an inspection. Before you do that, make sure you take pictures of the damage to show that repairs were completed. Then, submit to the DMV a completed Salvage Vehicle Information (OS/SS-4) form and Salvage Inspection Application, a bill of sale for all components used in the repairs, and your existing title to apply for a rebuilt title. The New Mexico Motor Vehicle Division requires a completed Affirmation for Specially Constructed or Reconstructed Vehicled (Form MVD10015), a Vehicle Equipment Affirmation (Form MVD10053), a VIN Affidavit, the car’s existing title, a bill of sale for all components used in the repairs, proof of insurance, and a weight certificate be presented at the DMV in order to obtain a rebuilt title. The Department of Motor Vehicles in New York offers Salvage branding if the vehicle is eight years old or newer and you complete a Salvage Examination/Title Application (MV-83SAL). You must also take to the DMV the title certificate, sales tax payment, and a personal check for $205 addressed to the Commissioner of Motor Vehicles. DMV.org states that you can apply for a rebuilt North Carolina title after you have an inspection and receive an inspector’s report. Along with that, you’ll need the salvaged title, rebuilder’s affidavit, list of replaced parts and proof of purchase for each part, proof of car insurance, a driver’s license and payment for fees. DMW.org says you must pass a vehicle inspection before applying for a rebuilt car title in North Dakota. You’ll want to mail or present to the DMV an Application for Certificate of Title & Registration of a Vehicle (Form SFN 2872), Certificate of Vehicle Inspection (Form SNF 2486), the existing vehicle title, and the $5 payment. The Clerk of Courts issues Ohio rebuilt salvage titles after an inspection by the Ohio State Highway Patrol. That report and the existing title need to be surrendered in order to receive the new title. According to DMV.org, the Motor Vehicle Division in Oklahoma requires you have an inspection (which costs $25) and pay an additional $4 for the VIN and odometer reading prior to obtaining a rebuilt title. The agent will check your VIN, look for signs of fraud, check the odometer and inspect your repairs. If the vehicle passes, you must send in the Application for Oklahoma Certificate of Title for a Vehicle (Form 701-6), a Rebuilt Vehicle Inspection (Form 788-A) from the inspector, bills of sale from any repaired components, and applicable payment for fees. According to OregonDriversLicense.org, you can file for a Salvage-Reconstructed Vehicle Title at your local Oregon DMV branch. Bring an Application for Title and Registration form, filling out the Reconstructed/Assembled/Replica section, or use the Assembled, Reconstructed, or Replica Vehicle Certification form. Be sure to record the odometer reading. You will need a valid inspection and possible emissions test depending on where you live in Oregon. Don’t forget to take your title, a bill of sale for any parts used in the repairs, and proof of insurance. DMV.org says that in order to apply for a rebuilt title in Pennsylvania, you must first take your fully repaired car to a state-approved safety inspection station. You will need the completed Application for Reconstructed, Specially Constructed, Collectible, Modified, Flood, Recovered Theft Vehicles and Street Rods (Form MV-426B) and title. You will also need receipts for all parts used in the repairs, auto insurance proof and fee payments. The inspector will take photos of your car, and you may need to have periodic inspections after this time, so keep all your paperwork. Take your application to PennDOT with your Application for Correction of Vehicle Record or Verification of Vehicle Identification Number (Form MV-41), existing salvage title, bill of sale, photographs from the inspection, receipts for parts, and payment of $53 for the title, $70 for registration and another 6% sales tax of the purchase price. According to the Division of Motor Vehicles, only an approved Rhode Island salvage rebuilder can work toward a rebuilt title. Find one, complete the work, then head to the inspection with copies of all receipts for replaced parts and labor, a certified check or money order for $56.50, a copy of the title, and a Certificate of Salvage Repair. After the vehicle passes inspection, submit all your documentation to the Division of Motor Vehicles. The South Carolina Department of Motor Vehicles offers a rebuilt title after the car passes an inspection, according to DMV.org. The inspector performs the check at the rebuilder’s place of business and you must supply receipts for all parts used to rebuild the car, photographs before the repairs. and the existing title. They will provide you with a Final Certificate of Inspection; take this with your receipts and title to the SCDMV to get back on the road. The South Dakota Department of Revenue requires you show them the title and MSOs, plus bills of sales, receipts, and any other information from parts used in the repairs. You will also need the Application for Motor Vehicle Title and Registration along with an Application for Inspection of Rebuilt Motor Vehicle when you submit your information to the county treasurer. Inspection fees are $25 and the application fee is another $10. Most inspections occur once a month and are by appointment only. The Tennessee Department of Revenue requires you to mail them the salvage title, Application for Motor Vehicle Identification Certification, color photos from the totaled vehicle and receipts for all replaced parts. This also includes a $75 fee. The vehicle must also have passed an inspection. Once the review is complete, you will receive a stamped certificate to take to your county clerk to obtain a rebuilt title. DMV.org says you need a Texas Rebuilt Vehicle Statement (Form VTR-61) and all the bills of sales for parts and labor involved in the repairs. Approval requires an inspection by the Texas Department of Public Safety, who will write an authorization code on your VTR-61 which you will then present to the county tax assessor’s office. Along with that, make sure you have your Application for Texas Title and/or Registration (Form 130-U), existing salvage title, and payment for applicable fees. DMV.org states that to obtain a rebuilt title in Utah, you first need a safety inspection from the Utah Highway Patrol. Take the bills of sale and receipts from all repairs, a vehicle damage disclosure, descriptions of all the repairs, and a signature from the shop attesting to the description. Once the Highway Patrol signs off, take your documents to a DMV office along with the existing title, completed Vehicle Application for Utah Title (Form TC-656), and payment for a $6 fee. In Utah, some cars will qualify to skip the rebuilt title stage if there was only damage to one major component. According to DMV.org, Vermont requires potential rebuilt title applicants to take their vehicle for a safety inspection before applying for a rebuilt title. You need to have the completed Application for Assignment of VIN/HIN (Form VT-003), salvage title, bills of sale from all parts used in the repairs, and pictures of the car with you. Then, submit the completed Rebuilt/Salvage Title Application (Form VT-017), proof of inspection and $35 fee to the DMV. The Virginia Department of Motor Vehicles requires a safety examination prior to issuance of a rebuilt title. You must send in the salvage certificate, a Request for Examination of Rebuilt Salvage Vehicle (LES 022A), a $125 examination fee, and a $15 substitute title fee to the DMV. Then, a special agent will contact you for appointment. After passing, you may apply to receive a rebuilt title. DMV.org states that in Washington State, you can receive a rebuilt title without an inspection as long as you are the car’s original owner. Simply apply for a rebuilt title at your local DMV just like you would a regular Washington title. According to DMV.org, to obtain a rebuilt title in West Virginia, you must submit your vehicle to both a safety inspection and a reconstructed car inspection after all repairs are made. Make sure you do them in that order. Then, apply for your rebuilt West Virginia title at the DMV office. Bring your salvage title, original Reconstructed Vehicle Examination (Form DMV-SV-3) and completed Application for Certificate of Title (Form DMV-1-TR) with proof of insurance and payment for $35 in fees. The Wisconsin Department of Transportation will issue a rebuilt salvage title after the vehicle passes a safety inspection, upon submitting all required paperwork at a local DMV office. The Department of Transportation Motor Vehicle Services of Wyoming issues a rebuilt salvage title after you present to the county clerk’s office the details of all repairs, photos of the vehicle, and a completed Application for Rebuilt Salvage Vehicle Decal. Law enforcement will then inspect the vehicle and sign off on a Certification of Correct VIN Number form. Take all paperwork to the county clerk’s office for plates and titling. Most states require bills of sale for any parts involved in the rebuild. This ensures that stolen, illegal, or inferior off-road only parts were not used in the repairs. Failure to comply with your state’s laws regarding rebuilt titles can result in fines, tickets, misdemeanors, or even felonies. For any state, plug the given name of a required document into a search engine to find it. Call your DMV office with any questions or concerns. If you are looking to save some money on your next used car purchase, or if you’re a hobbyist mechanic with time to spare, then buying a car with a reconstructed or rebuilt title might be the answer. Proceed with caution and don’t rush into anything. What might seem like a good deal today could quickly turn into a costly headache down the road. Please take a moment to email us if you spot any errors in this article. Newer PostWhat are Parts Only Cars and Should You Buy One? Older PostWhat is a Bonded Title? Is It Right for You?